He is sired by Senator, out of famous Ranger Measles, by Texas Ranger out of Measles. He is slightly larger than Senator with more bone & substance. 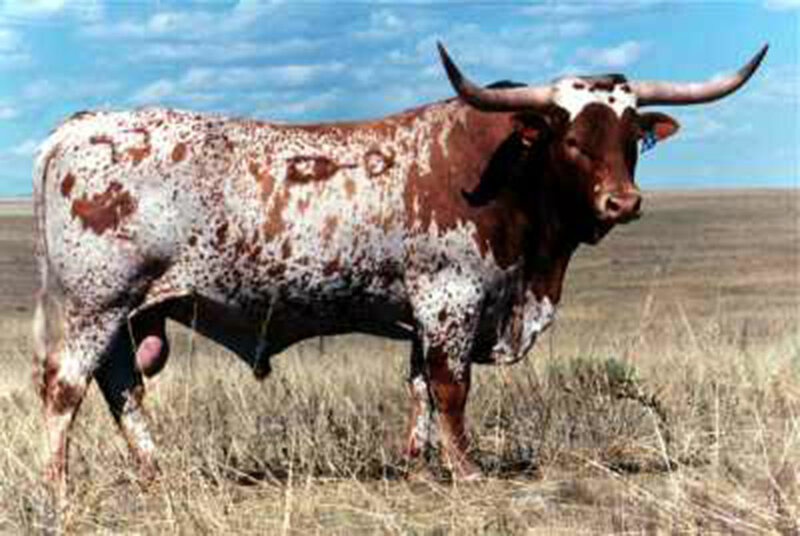 His length of hip between the hooks & pins is believed by many Longhorn breeders to be the longest in the industry. Sequel is being used by people who desire excellent milk production, beautiful Measles color specks, good disposition & lots of size. As a young bull, he replaces many of the older sires that had a lot of substance. He is one of the thick sources of close up Ranger's Measles blood. Many people feel that Ranger's Measles is the all time leading dam in the industry having also produced All American, Pring, Impressive, Tri W Slide Rule, Bail Jumper, Emperor & Northern Star. Use him to increase beef quality and retain color, horn, and conformation. He has numerous working oxen sons in Costa Rica.